Travel systems – Generally travel system strollers have an infant seat that attaches to the frame of the stroller. While this is a convenient stroller because you don’t have to buy a stroller and infant seat, a baby shouldn’t seat for a prolonged period on their infant seat. It can cause a misshapen skull and cause breathing problems. Stroller frames – This is simply a frame for attaching an infant seat and, for the same reasons as above, you may want to pass on this type of stroller. 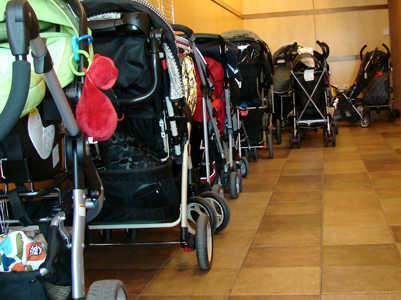 Standard strollers – These strollers are the most common type of stroller on the market. They are lightweight and they easily fold up to make it easier to transport them in your vehicle. The seat can recline back so that you baby can sleep laying down. and there is usually a sunshade attached to the stroller. Umbrella strollers – This model is a simple lightweight stroller that folds in half vertically so it is easy to carry in your car. It is usually better for a toddler as it is basically a cloth seat on wheels and isn’t supportive enough for an infant. Jogging strollers – They make it easier to take the baby when you go running because they have larger wheels with tire trends that can roll over concrete, dirt and even gravel paths. They are built to be comfortable for baby while you exercise. In order to figure out how to choose a baby stroller for your specific needs, you will want to test out the stroller features before purchasing a stroller. This will save you time, aggravation and money if you test it out. Unfold it – See how easy, or difficult, a stroller is to unfold with one hand. Usually the other hand has a baby in it. Roll with it – Put your baby in the stroller with all the items that you will take along with you, usually the diaper bag, and see how well it moves around. Push it with one hand as well.